Lebanon, a mountainous country with summits reaching heights of over 10,000 feet, is often referred to as the "Switzerland of the East". Lebanon is home to six well-equipped, ski resorts, located on the Mount Lebanon range that faces the Mediterranean and offers terrific downhill ski slopes.FarayaMzaarKfardebian, The Cedars, Laqlouq, Fakra, QanatBakich, Zaarour. One of the special resorts, theOyoune el Simaneresort known today as MzaarKfardebian formerly known as FarayaMzaarthe largest ski resort in the Middle East.Located at only 1 hour from Beirut, MzaarKfardebian ski area is widely regarded as one of the most scenic and entertaining mountain resorts in Lebanon. Not only are you immersed in natural beauty with the mountains surrounding you, immersed in the picturesque Mount Lebanon scenery, but the skiing at Mzaar is absolutely fantastic. "Mzaar" is the Arabic word for sanctuary. The highest mountain in Ouyoune el Simane was called "jabal el mzaar" (mountain of the sanctuary) after a small Roman temple built on its top. It is believed that the Romans were using fire as signals to communicate between the costal area and Baalbeck, or Heliopolis, through Faqra and the Mzaar peak. The temple was totally destroyed during the civil war (1975-1990) and its stones were stolen. The real name of the area is Ouyoune el Simane (Meaning Simane springs) and it is administratively under the jurisdiction of the municipality of Kfardebian, which is also the case for the Faqra area, although the resort is commonly referred to as "Faraya-Mzaar" or "Faraya". According to carter, dunston&thomas, 2004.In the book “Syria and Lebanon”.Skiing ranges between heights of 1,850 metres (6,070 ft) at Mzaar-Kfardebian, to 2,465 metres (8,087 ft)on the peak above Mzaar. On the top of Mzaar slope, upon exiting the chairlift, there is a view over the Bekaa valley, Mount Hermon of the Anti-Lebanon and other peaks like Zaarour, Laqlouq and the Cedars. Coastal towns and the capital Beirut can be seen on clear days. 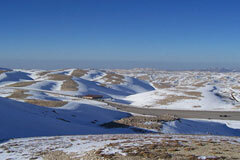 The peaks of the Mzaar-Kfardebian mountain range vary between heights of 1,913 and 2,465 metres (6,276 and 8,087 ft). 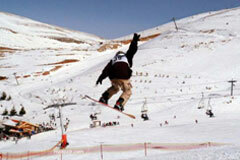 The highest peak is Mzaar, followed by Wardeh and Jabal Dib (mountain of the wolf) Peak, offer challenges for the experienced skier or snowboarder. 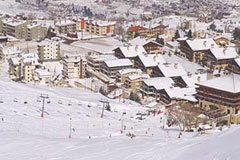 The ski resort has 42 slopes and 80 kilometers of groomed tracks. 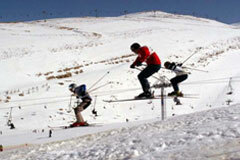 The skiing season in Lebanon is similar in length to that of the Alps stretching over a period of 4 months. Three other peaks are well suited for beginners, and even more are adapted to skier of intermediate level. In addition, there are a number of cross-country trails. Usually, opening hours during the week is from 8am to 3:30pm but it extends until 4pm during the weekend.